Full disclosure, I had this post without pictures in my drafts to complete since Bob and I went to Europe with my sister and her husband four years ago. When today’s blogging challenge writing prompt suggested a travel post, I thought maybe it was time. I enjoyed reminiscing. I hope you’ll forgive me for waiting four years to post this, but better later than never. 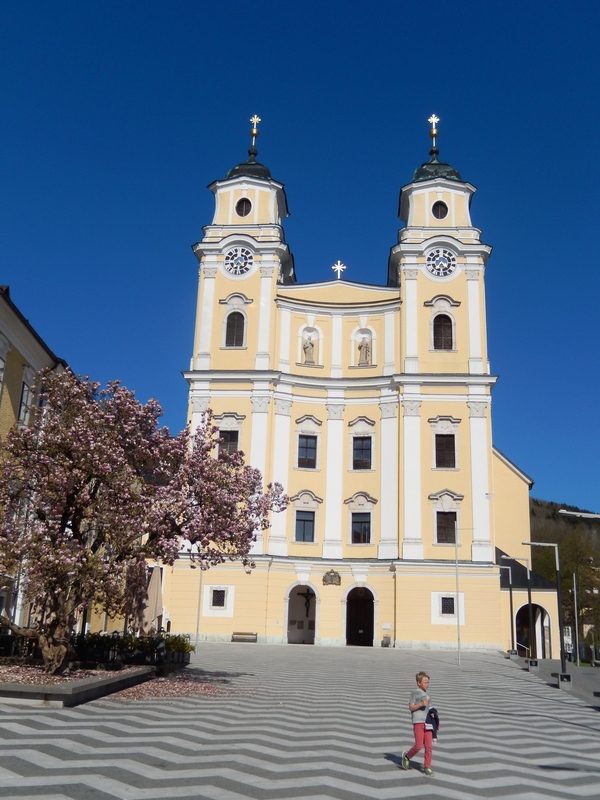 When I came to realize that the Sound of Music was set in Austria, I knew I had to go there. Maybe it was the lure of the mountains, maybe it was the leiderhosen, maybe it was the fact that the highest point in Florida is just above sea level, I don’t know. 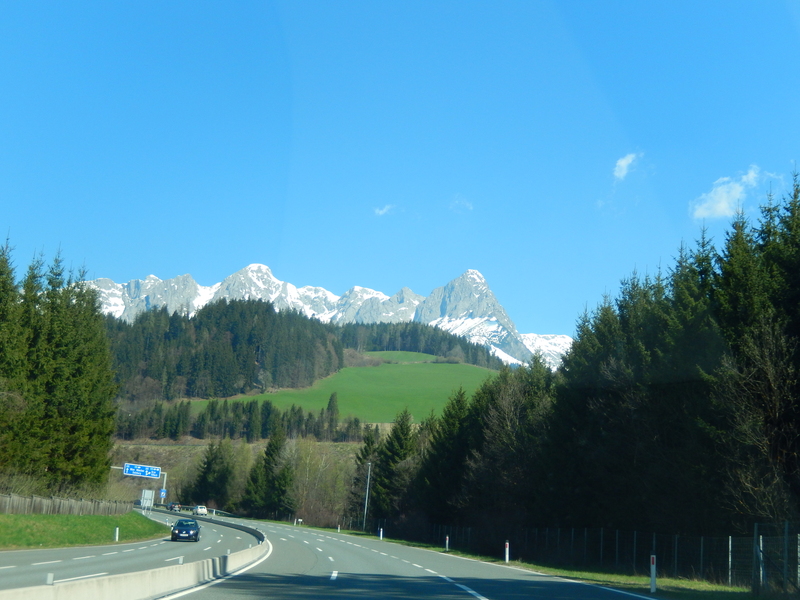 But if those hills really are alive with the sound of music, by golly I was going to hear it. The Sound of Music tour was fun. Picture a bunch of strangers and strange people on a bus being led around by a cute, young English lady in traditional Austrian leiderhosen. In between stops we would sing along with the movie score. 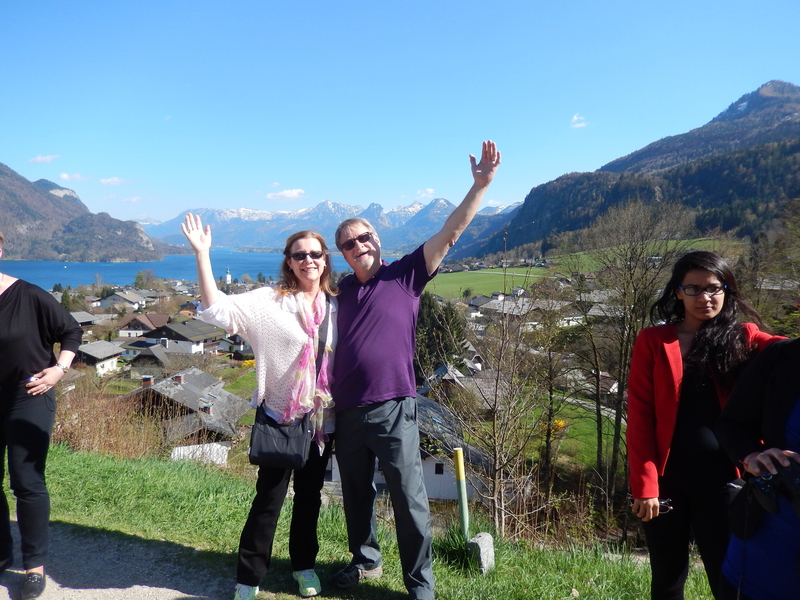 It was there that I discovered that my sister, Chris, who was traveling with us, could yodel. She’s very talented! We visited the lake in the back of the house where Maria and the children, while dressed in curtains, fell out of the boat. The lake was not at the actual back of the house used in the movie. They filmed in two different locations. This would have been where you would have expected to see the gazebo where 16 going on 17 was sung, but that has been moved to a different area. It used to be in a private backyard, but the people who owned the house grew weary of strangers leaping around in their backyard at all hours of the day and night so they donated it to the city, who moved it to a park. Bob and I were actually dating when I was 16 going on 17. 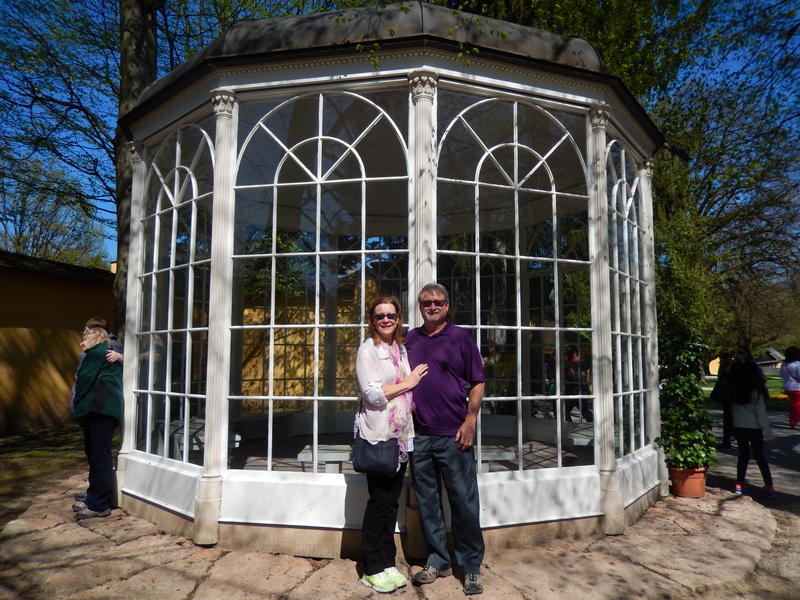 We never had a gazebo to dance around in though. 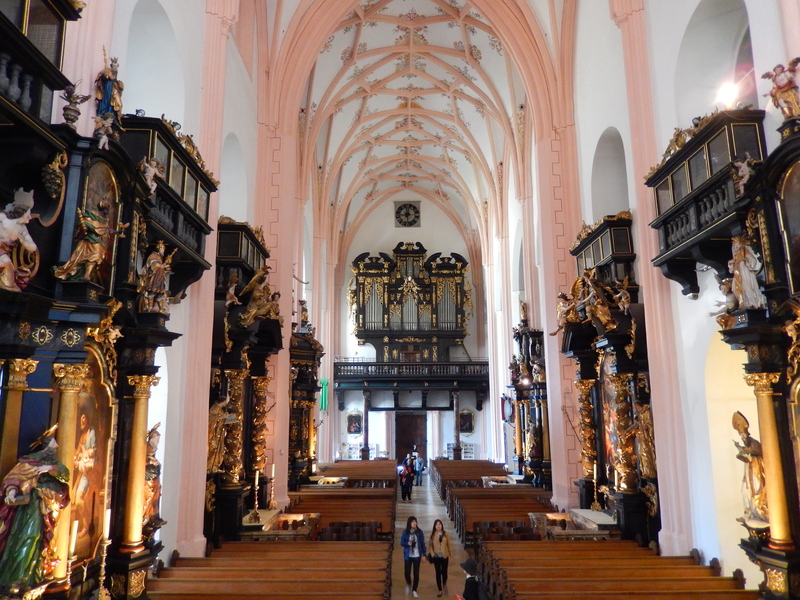 Of course, the church where movie Maria married the Captain was spectacular, as was sitting in a cafe eating apple strudel during a break in the tour. 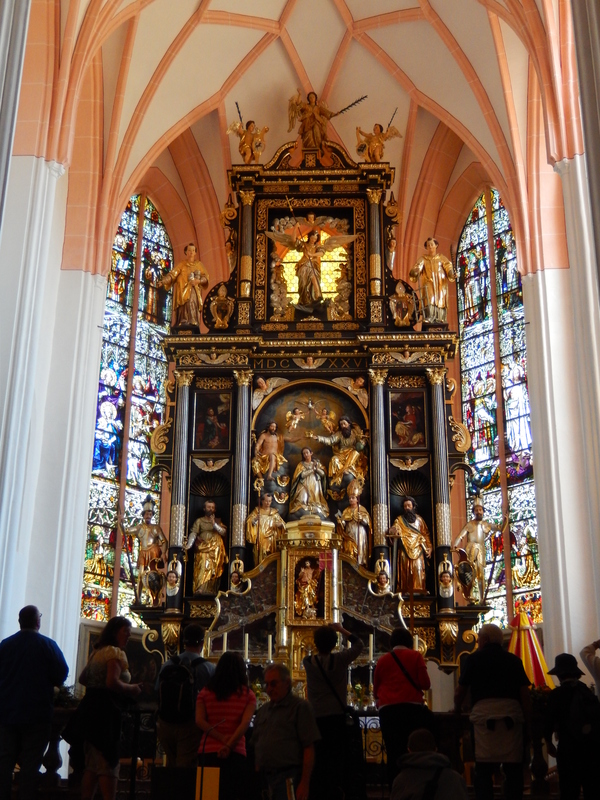 This church was chosen for Maria’s wedding to allow for great views from above of the long train on her wedding dress. We also visited the lake district even though it is barely featured in the movie. It offered some of the most spectacular views I have ever seen. Bob and I in the Lake District. For some reason we keep singing and raising our arms. 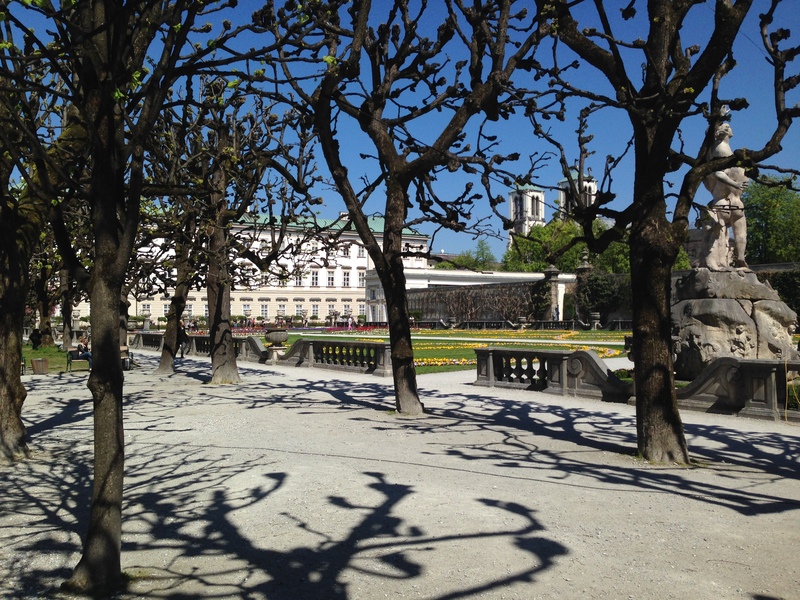 A highlight was Mirabell Gardens, which we visited while waiting for our tour bus. I came to realize that these beautiful gardens were the ones featured in the movie. Our April visit was perfect for the commencement of spring flowers, which added to our enjoyment of the park. 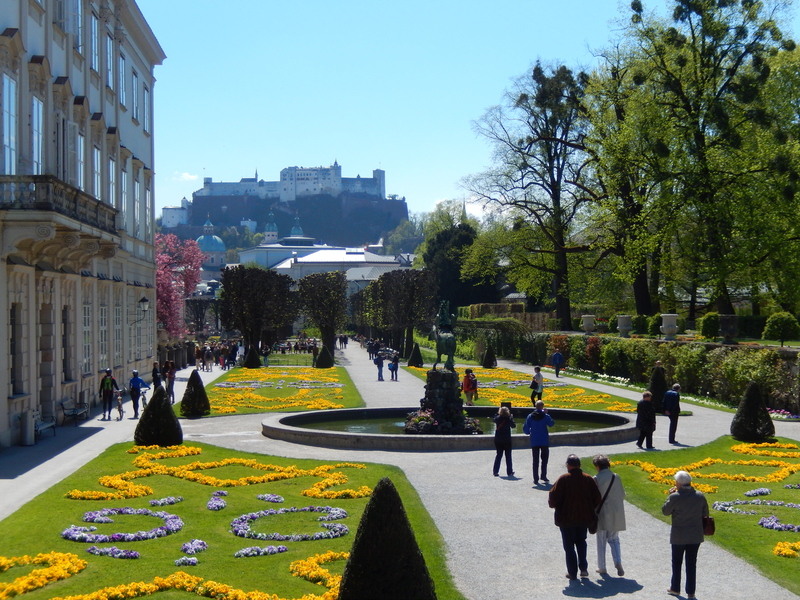 After the tour, we wandered around the old town and found ourselves in an area that looked more like Rodeo Drive than Salzburg. There was even a Starbucks there. It seemed wrong. So we pulled out our trusty Rick Steves Guide and sought out a place to eat. 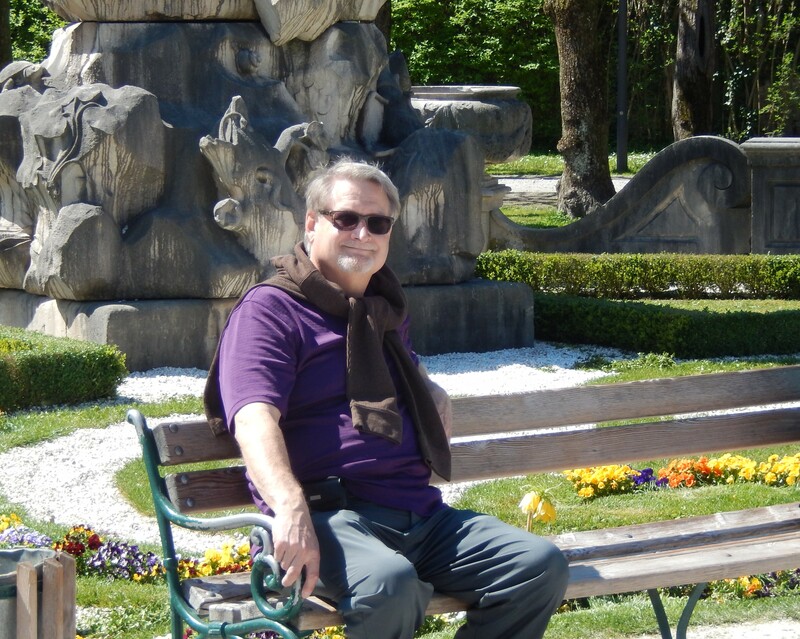 Rick always encourages his readers to go to Europe through the back door. The door we went through seemed to open into a different city altogether, so we were happy to put our hands in the hands of the man who travels Europe for a living. 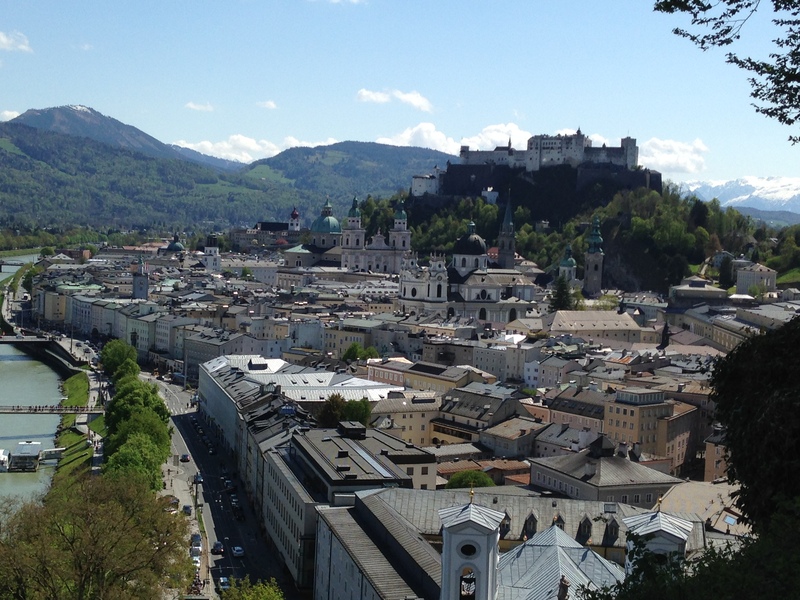 We found our way back into the charming Salzburg that we had so quickly fallen in love with. 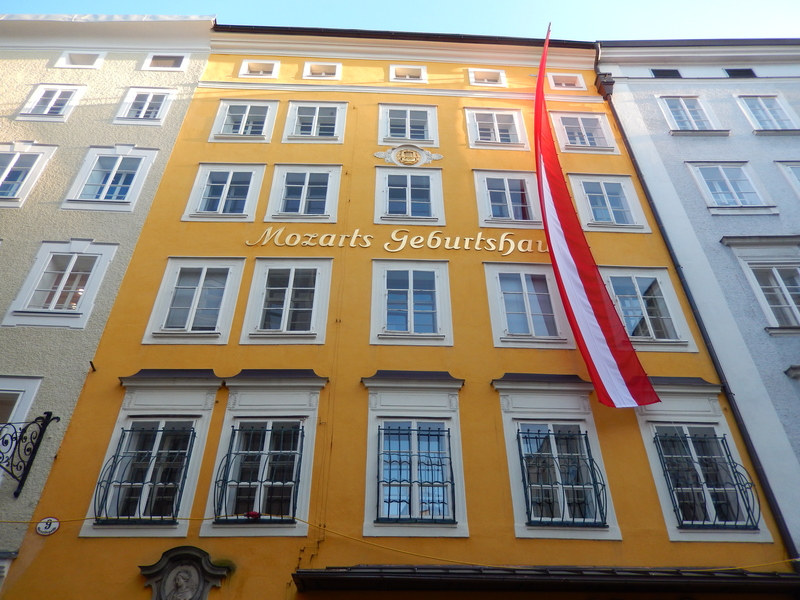 Mozart’s birthplace. No pictures allowed inside. First time we stopped at Mozart’s house, it was closed. I tried knocking but nobody was home. 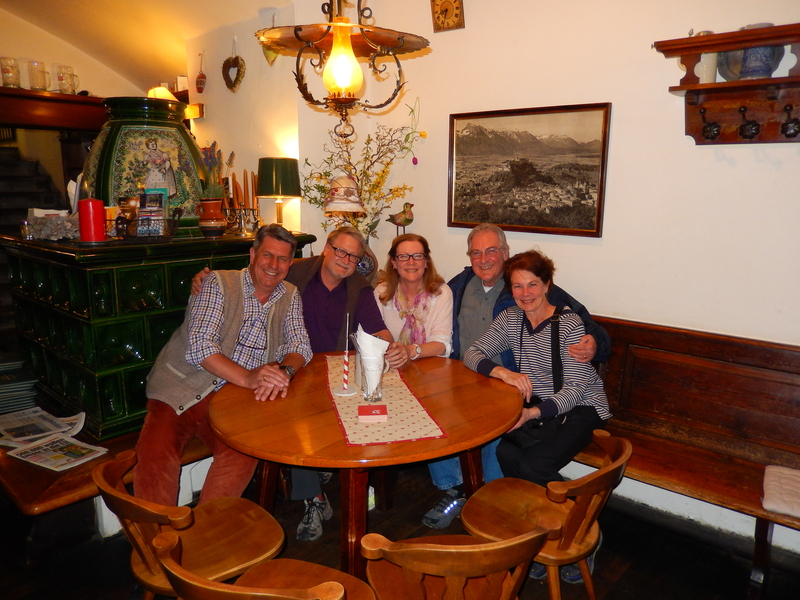 Just down the way from Starbucks was the house where Mozart was born, and thanks to Rick, nearby we found a restaurant called Gasthaus zum Wilden Mann. We felt like we had entered someone’s private home. It was rustic and charming. The owner, Robert, greeted us as we entered. I offered my “Gruss Got” greeting, and then inquired if I had used it correctly. He smiled and said, “Yes, we always like to praise the Lord when we greet people.” Gruss Got literally means God is good. 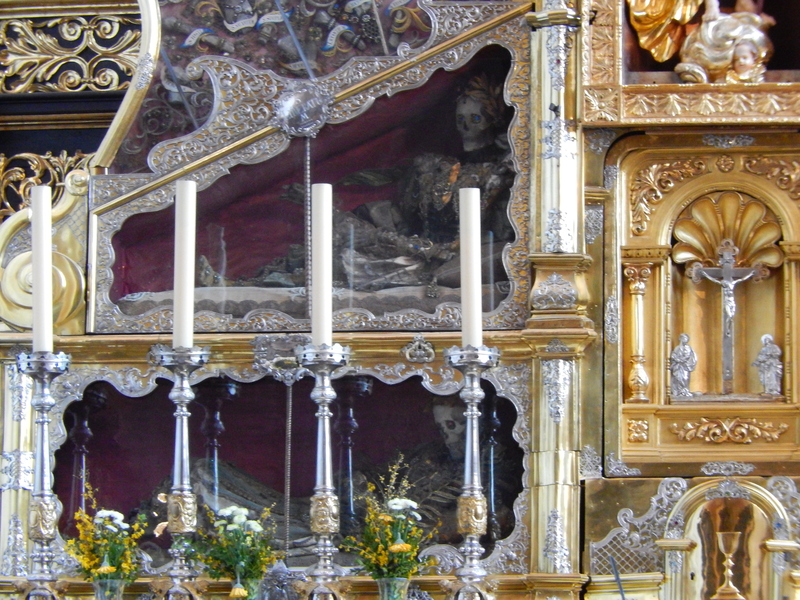 We sat at the corner table under a crucifix. So we had a bar in one corner and Jesus in the other. Antlers were on every wall. Robert sat with us and helped us choose our dinner. He said, “You need to spend some time with me.” We heartily agreed and by the end of our meal, we felt like we had been with an old friend. He sat with us for our entire dinner. It was as if he had nothing better to do. 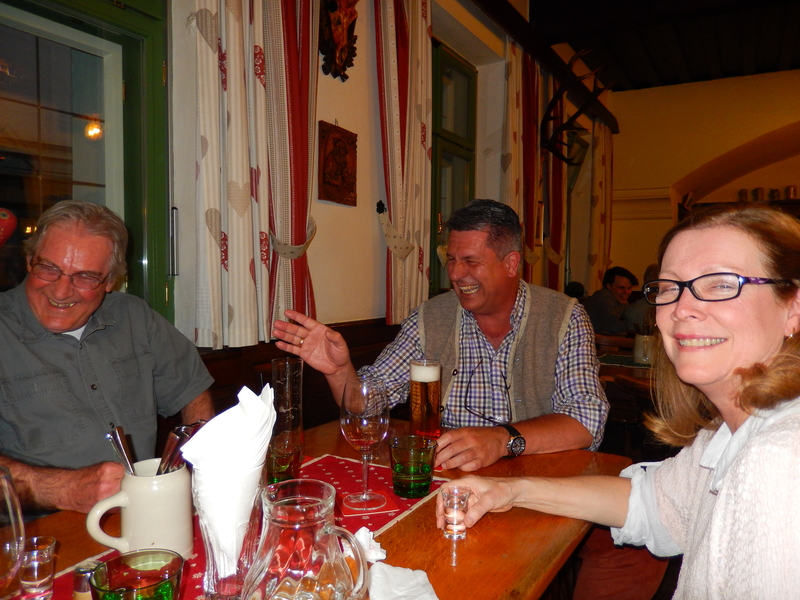 This was a great example of hospitality and slowing down to smell the roses, or in this case sausages and beer. 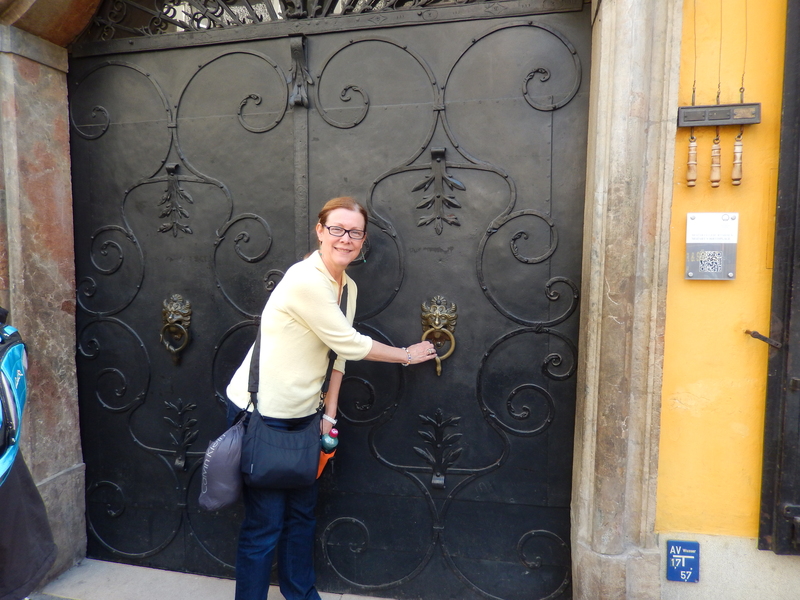 Thanks to Rick Steves for showing us the back door. 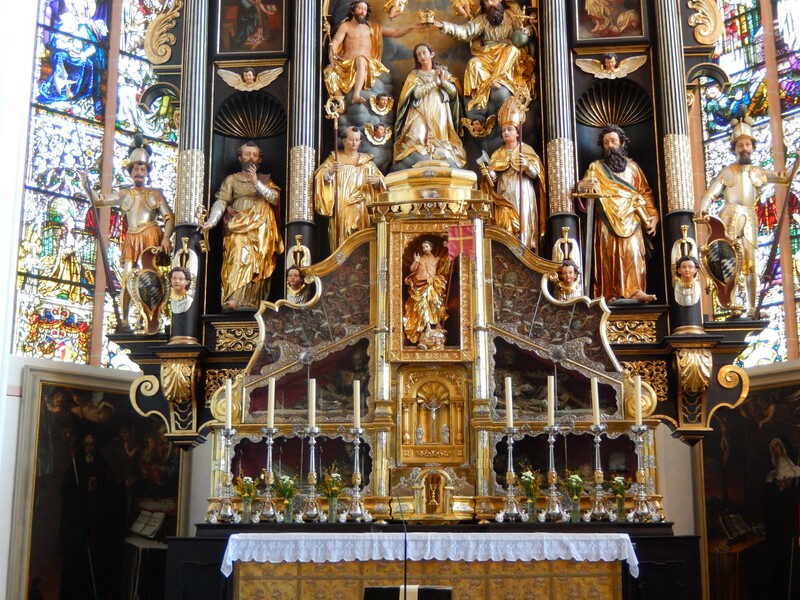 This is Post #11 in the Ultimate Blog Challenge to post every day in April. Easter is quickly approaching so if you have shopping to do to fill those baskets, you may want to consider purchasing Jesus. 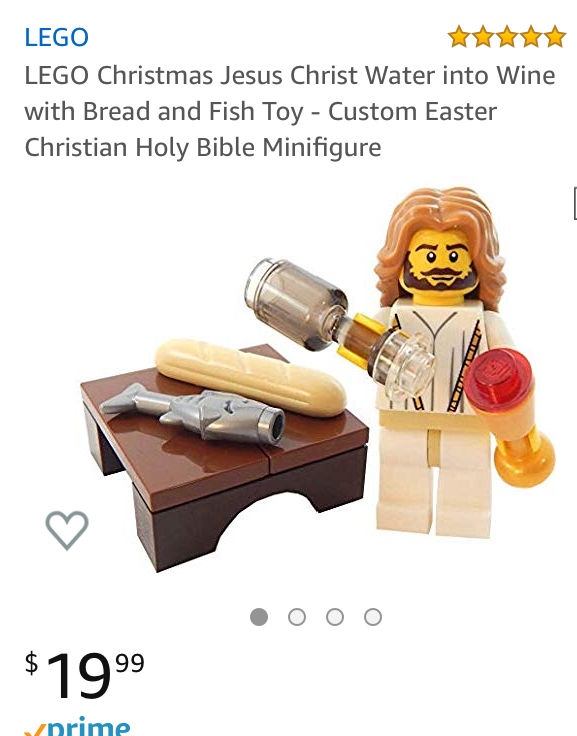 He’s available in LEGO form for the low price of $19.99, and with Amazon Prime, Jesus could be delivered to you in two days. He’ll be ready to turn water into wine, so be cautious about the age of the person who receives Jesus. While it’s fine to receive Jesus into your heart at any age, wine drinking should be for the responsible adult. I think Jesus would agree. This is Post #7 in the Ultimate Blog Challenge to post every day in April. Getting to the root of the problem: Are you too preoccupied with ugly roots to enjoy the beauty of the flower? In January 2016 a Whole Foods opened near me, so I had to check it out. I had heard how expensive they were, but I also had heard how unique and beautiful the store was. I didn’t plan on buying anything, but you never know. It was a madhouse that day and I would have left empty-handed except for the orchids. Their grand-opening special was a beautiful potted Phalaenopsis orchid for $10. I displayed it on my bathroom counter where it was very happy enjoying the morning sun. (Plant tip #1 – find a happy place for your plant and it will thank you.) The flowers greeted me every morning and they lasted a long time, much longer than any $10 bouquet I could have purchased. That’s my outlook on potted plants – if they give me at least a season of return and they never really thrive or bloom again, then that’s okay with me. It wasn’t a bad investment. But this little guy is the little orchid that would and could and did. Here’s a picture of it today. It has looked like this for over a month. This is its third re-bloom and first double shoot. That’s amazing to me. I like to look at this orchid face. It’s so cheery. This weird root system supports the lovely plant. A lesson from this beauty is that you can’t judge a plant by its root system. Its roots are messy and visible and they look like they need attention – not unlike myself after four weeks out from the hairdresser. Since I see this plant every day that it’s blooming, I really hardly notice the roots. I just look at the beautiful flowers. That is until I came home one day and discovered that a friend saw my plant and thought she would water it for me because the roots looked so dry. I tried to be nonchalant about this and told her that I had actually watered it that very morning. She couldn’t believe it and felt horrible. I told her no worries. I set it outside to help dry it out a little and reminded myself that, hey, it’s just a $10 plant. 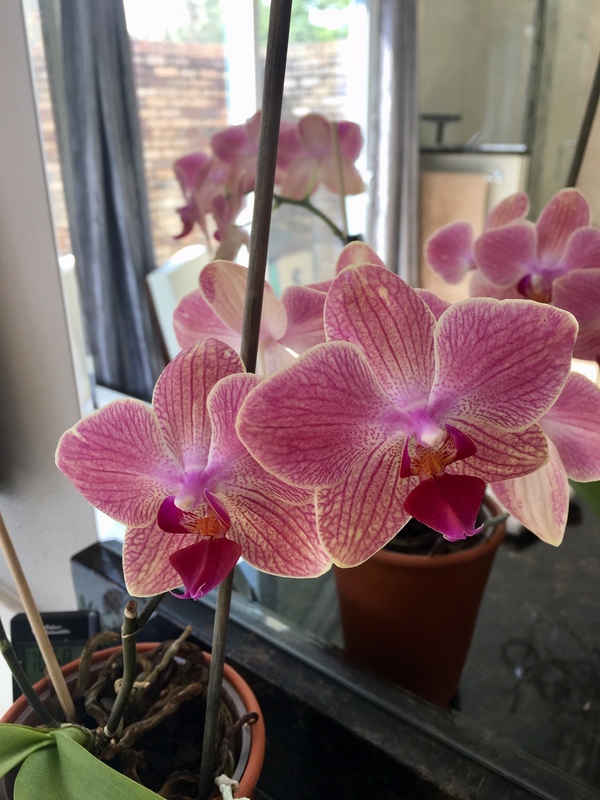 Once a week I set this orchid in a couple of inches of water for 5 minutes – never watering it from the top. That’s it. Five minutes a week and this is what you get. 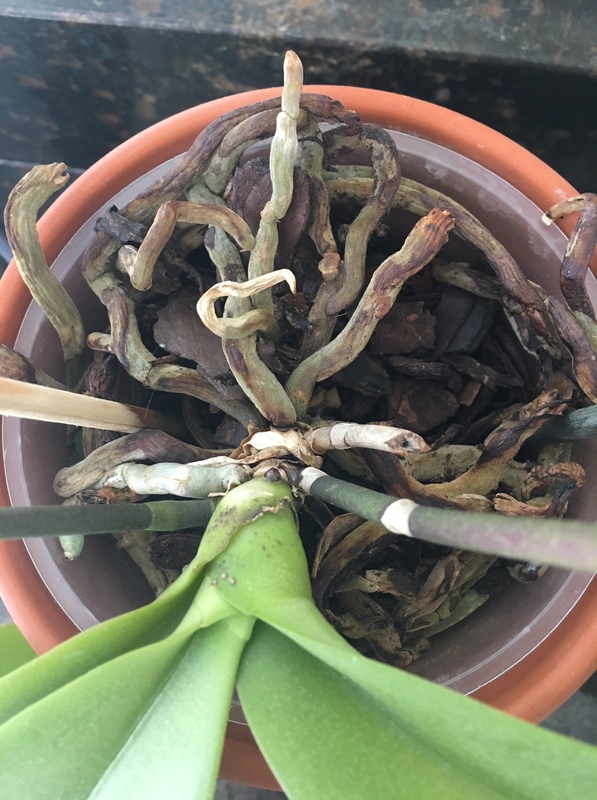 Not only that, when the blooms fall off, I cut it back below a juicy knuckle (as my orchid-growing friend calls it) and set it outside in its outdoor happy place (remember I live in Florida), which gets some sun but not too much. I ignore it until it puts out another shoot. This has worked over the last three years. Nobody is more surprised than I am. I’m sure I would have killed this by now if I tried to replant it to make those roots less conspicuous. The roots are part of its beauty. They’re weird-looking and provide a great contrast to the delicate-looking orchid. I have cut back some dead ones before (they look brown and papery), but that’s it. I know you may be expecting some kind of humor here, but the funny thing is that people look at me as some kind of an orchid expert when the truth is I just ask questions, read labels, and moved the plant around until I found its happy place. Plants have them just like people do. 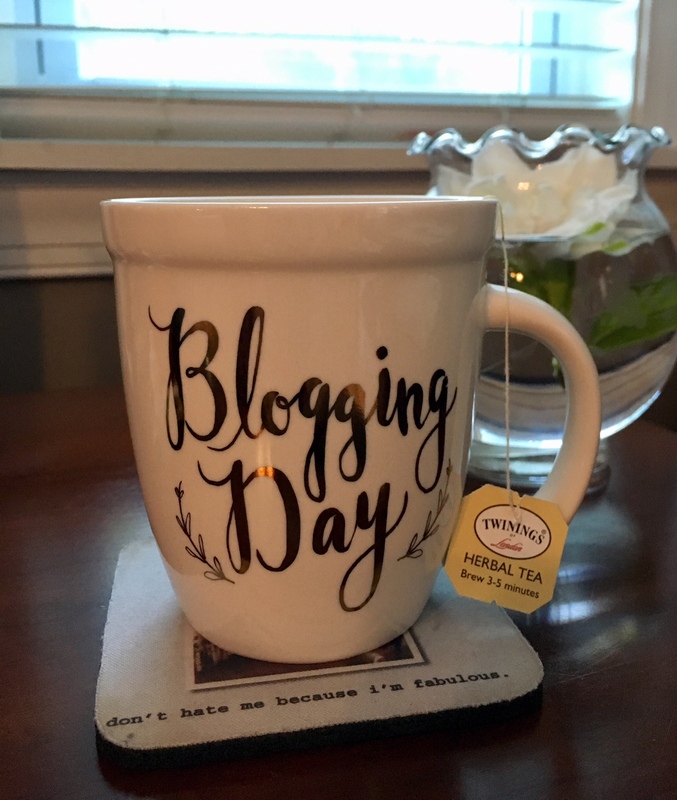 This is Post #6 of the Ultimate Blog Challenge to post every day in April. 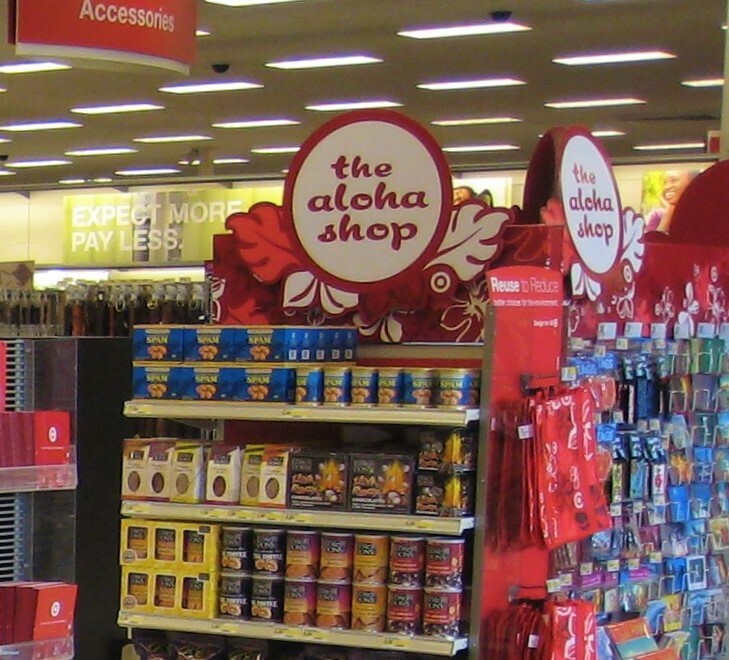 We made a very unexciting purchase recently – a purchase that we didn’t exactly agree on. It’s not like there was a huge discussion though. We bought a new a garbage can. I thought our garbage cans were acceptable. I even asked the guy on the truck and he said he’d seen a worse. But Bob likes to replace things before they disintegrate, so he decided a new one was in order. I really do appreciate Bob not waiting until things are dilapidated before replacing them. That was the same reasoning he used when he bought me my car, so I should just shut up about it. But I knew he would go off to work with a view of our garbage cans in his rear-view mirror, and I would be faced with the question: How does one throw away a garbage can? It’s not like I could put one inside of the other. I already had the word from the garbage collectors, who are experts at such things, that ours was not necessarily garbage material. Even though the very name garbage can could be interpreted as such, but I digress. So, I decided to listen and wait for the sound of the truck coming down the street. They usually collect around 10 in the morning, I’d just rush out and meet them. Of course, that day they came at 4 in the afternoon, so I spent most of my day jumping up and running to the door to see if they were coming. It was like I was a kid waiting for the ice-cream man. Finally, they came and the disposal of our trusty, old can was complete. 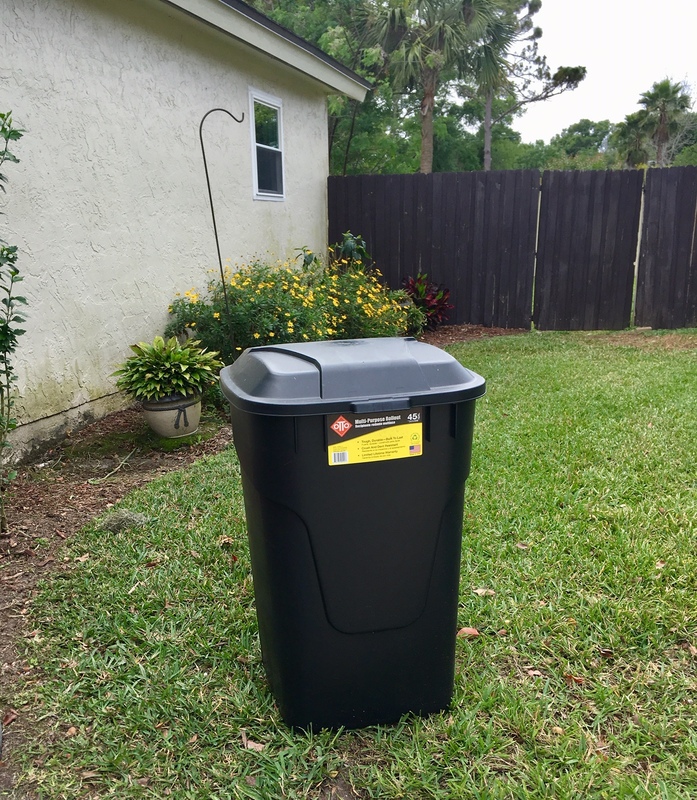 Shiny New Garbage Can – Isn’t it pretty? But that opened up an entirely new situation. Every time I’d take the garbage out, I would put it in the remaining old can, the lesser of the two evils, which Bob kept. The new one was so nice and shiny. It didn’t even smell like garbage. It seemed wrong to treat it like it was any old garbage can. I wanted to keep it nice for as long as possible. I didn’t realize how weird this was until I went to throw garbage out and saw that Bob had placed the new can to the front and he had put garbage in it. Can you imagine a person doing such a thing? He had reduced the older, beat-up can to back-up. “What are you saving it for? It’s a garbage can,” he said. And it was. He filled it with too much garbage for me to switch to the other can. It was over. The garbage smell had arrived. Try as I may, I couldn’t save it.